Workers in construction, especially equipment operators, require a lot of training, practical guidance, and information on industry rules and regulations before they can operate equipment. 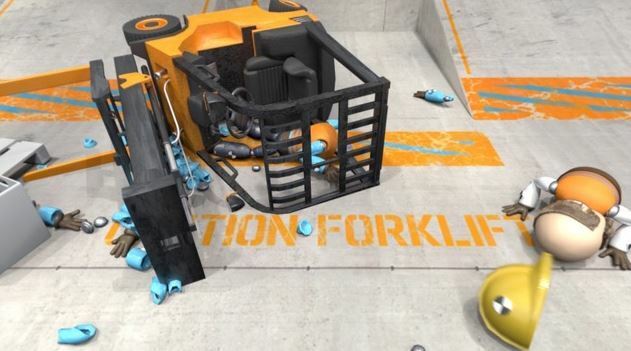 Forklifts can be dangerous and cause about 100,000 injuries every year. And the main cause of forklift accidents were because operators weren’t trained correctly. Forklift training is the best way to lower the number of forklift accidents, saving workers’ lives, and for lowering equipment damage costs. Training can come in many forms, from written instruction to in-person examples, but each of these forms aren’t completely effective without the immersion of the student. That’s where virtual reality comes in. CertifyMe.net is the number one online training platform for new and experienced forklift operators, and has developed a virtual reality program that goes along with their training. The virtual reality system provides students with in-depth training that is more convenient and affordable than in-person education and more effective than written programs alone. According to the Virtual Reality Society website, virtual reality is a term used to describe a 3D, computer generated environment that can be experienced by a person in a similar manner as real life. The person experiencing a virtual reality program may be able to look around as if they are actually present in the scene they are looking at. They may also be able to move objects in the virtual world and perform certain tasks. Virtual reality is usually experienced using computer technology, such as an online program or app. There are also different ways people can see in virtual reality to view a lot of different locations, scenes, and environments. These include headsets, 360-degree views and movement on treadmills, and special gloves that allow you to interact with objects in the program. It can be complicated, or it can be simple and easy to use at home. How Does the Virtual Reality System Work with CertifyMe.net? The virtual reality product with CertifyMe.net can be used by downloading an app through the Google Play or Apple iTunes Store. In an effort to encourage more operators to seek the quality training they need to prevent injuries and fatalities, the app is free for anyone who feels it may help them, and comes with free VR glasses if you ask for them. It is also available on YouTube and can be viewed with or without VR glasses. Once you’re inside the app, you become “Joe” the new forklift operator. Your supervisor is “Gary” who will be teaching through trial and error how to operator a forklift, and how to avoid accidents. The error part comes into play when you actually experience several types of accidents that are common in work environments with forklifts. From the comfort of your home or other quiet space, you get to experience a full 360-degree visual of a typical warehouse with objects, boxes, crates, and obstacles and challenges around every turn. The VR app provides virtually the same experience you would get if training inside a warehouse. You even get a firsthand account of an accident occurring due to operator error that would not be possible to show in a real-world setting. How Can The VR System with CertifyMe.net Help Construction Workers? 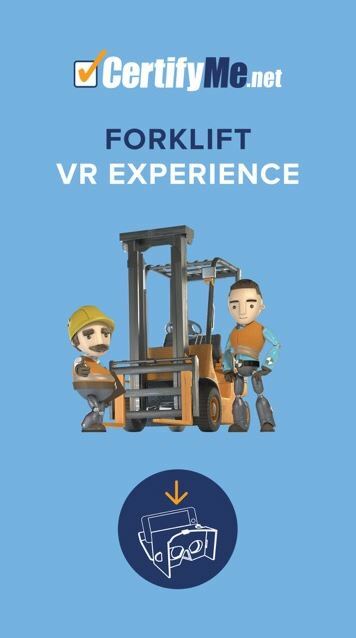 The virtual reality program with CertifyMe.net was created to try and bridge the gap between quality and effective forklift education with a tool that can be made available to just about any construction worker. As new workers enter the workforce from the Millennial generation, the virtual reality system will be even more relevant and effective as it speaks directly to those technology-surrounded employees. CertifyMe.net’s new virtual reality app will make it possible for students to experience scenarios that wouldn’t be possible in the real world. How is CertifyMe.net’s Virtual Reality Program Making an Impact? Virtual reality guarantees an experience that hasn’t been possible until this day and age. It combines all the information you need in an easy-to-use platform that is convenient, affordable, and can be accessed at home or on the go. As experts in the construction field, the founders of CertifyMe.net understand what workers need to be ready to operate forklifts. They created the virtual reality system to demonstrate that experience can be a cruel yet effective teacher. Without requiring anyone to risk their safety, viewers of the program as “Joe” can learn the hard and easy ways to operate a forklift properly. Why Choose VR Over Traditional Forklift Training Platforms? The main benefit of training your workers with a virtual reality system is that it eliminates the safety and cost risks that can come with forcing workers right into the seat of a forklift as a new operator. Inside of virtual reality, mistakes can be made and learned from, and tasks can be performed without any risk of injury or damage. It can grab the attention of the younger millennial generation, and provide easy-to-use, useful information for seasoned operators too. Combined with what experienced forklift operators know, CertifyMe.net’s VR system can provide the high quality information you need in an environment that prepares you to be a forklift operator.